Some frequently asked questions about omega oils. Essential fatty acids (EFAs) are polyunsaturated fats that our bodies need but cannot produce. Therefore, they must be consumed through food or supplements. There are two families of EFAs: omega-3 and omega-6, which need to be consumed in a balanced ratio. The body must receive a balanced supply of omega-3 and omega-6 EFAs to ensure proper eicosanoids production. Eicosanoids are hormone-like compounds that affect virtually every system in the body-they regulate pain and inflammation, help maintain proper blood pressure and cholesterol levels, and promote fluid nerve transmission. The problem is that, in our modern industrialized food system, omega-3s have become largely absent from the food chain while omega-6s have become overabundant. Even the healthiest diets contain too many omega-6s and not enough omega-3s. Decades of scientific evidence indicates that this EFA imbalance can contribute to chronic inflammation and a variety of chronic health issues. The most beneficial omega-3s that we're missing are EPA (eicosapentaenoic acid) and DHA (docosahexaenoic acid). Purified fish oil is the best direct source of EPA and DHA. WHAT ARE THE EARLY SIGNS OF OMEGA-3 DEFICIENCY? CAN WE GET ENOUGH OMEGA-3s FROM THE FOOD WE EAT? Fish is the primary food source of the omega-3s EPA and DHA, but Americans simply don't eat enough fish on a regular basis. Even those who eat fish several times a week aren't getting enough EPA and DHA because much of the fish consumed today is farm raised and lacks significant amounts of EPA and DHA. Also, many people are increasingly avoiding fish due to growing concerns about environmental toxins in fish (such as mercury, dioxins, PCBs, etc.). In addition, there are several factors that can lead to a reduced absorption of EFAs-age, poor diet, alcohol consumption, low levels of certain vitamins and minerals, some prescription drugs, compromised immune status, and a diet high in saturated and/or trans-fatty acids (meat, dairy, fast food, fried food, baked goods, and processed foods). Moreover, people with health challenges or those who are currently deficient often require a minimum of 2-4 grams a day of EPA and DHA, which is difficult to obtain from fish alone. WHAT IS THE RELEVANCE OF BALANCING THE OMEGA-6: OMEGA-3 RATIO? Over the past 100 years, changes in the food supply in Western nations have altered the type of dietary fatty acids we consume, leading to a dramatic increase in the ratio of omega-6 to omega-3 fatty acids. This increased omega - 6:omega-3 ratio is known to influence inflammatory responses, contributing to higher incidences of many chronic diseases. To address this omega-6:omega-3 imbalance, current recommendations suggest increasing the consumption of pre-formed omega-3s EPA and DHA in fish and/or fish oils, increasing intake of ALA (an omega-3 alpha-linolenic acid found in vegetables, flax, fruits) and decreasing intake of LA (the omega-6 linoleic acid in meat, dairy, eggs, vegetable oils). DO PREGNANT WOMEN NEED OMEGA-3s? It is especially important for pregnant and breastfeeding women to consume DHA (one of the omega-3s in fish oil) because the developing baby is dependent on mom! DHA is an essential fatty acid-we must get it from diet or supplements, because our bodies don't make it-and consuming enough DHA is critical for normal and healthy development of infant brain, eyes, and nervous system. Inadequate consumption of DHA during pregnancy has been linked to shortened gestational periods and premature delivery, and postpartum depression. Experts recommend that women consume 300-600 mg of DHA daily while pregnant and breastfeeding. As with any supplement, it is best to consult your healthcare professional. HOW SOON WILL I SEE RESULTS FROM SUPPLEMENTING WITH OMEGA-3 FISH OIL? It will vary depending on the concentration of the fish oil, your current nutritional state, dosage, and current health. We often hear that customers "feel better" and experience "clearer thinking" and "enhanced well- being" within 2 weeks. For optimal results, we recommend you take your fish oil daily for at least two months to evaluate their benefits, and also reduce your intake of saturated, hydrogenated, and trans-fats. WHAT ABOUT OTHER BENEFICIAL OMEGA FATTY ACIDS LIKE OMEGA-5s, OMEGA-7s, OMEGA-9s? DO WE NEED THOSE TOO? 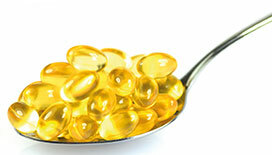 All non-concentrated fish oils contain a myriad of other omega fatty acids besides the omega-3s EPA and DHA. The average fish oil contains 23 omega fatty acids. Any quality fish oil manufacturer should be able to provide a chromatograph listing the levels of all the omega fatty acids found in their fish oil. Often, when fish oil is concentrated, some of these other fatty acids will be removed in order to increase the amounts of EPA and/or DHA. You often hear the most about the omega-3s EPA and DHA because those are the fatty acids that have been shown, by decades of scientific research, to yield important health benefits for every cell, organ, and system in the body, and are considered the most functional omega-3s. And they are also drastically deficient in the food supply of Western nations, making it very difficult for us to get adequate amounts from our diet. WHAT IS THE DIFFERENCE BETWEEN FISH OIL AND FLAX SEED OIL? Cod liver oil is extracted from cod livers, whereas fish oil is extracted from the body flesh of fish. While both are good sources of the omega-3s EPA and DHA, they provide different ratios-cod liver oil generally contains about 9% EPA and 14% DHA, whereas fish oil generally contains about 18% EPA and 12% DHA. Another difference is that cod liver oil also generally contains some vitamins A and D.
Visit us to know more about omega fatty acid supplements.